Rüdesheim is a very attractive town at the southend of the Rhine river. It is a very popular place because many cruises on the Rhine river have a stop here and tourists from all over the world are being offloaded on a daily basis. They head for the Drosselgasse, a charming 144-metre-long narrow cobblestone pedestrian street, queuing up to see the charming restaurants and wine houses. Music is played on every open air terras and the atmosphere is very lively. While all these cruising people are getting on shore, luckily a lot of people staying in Rudesheim are getting on a boat for a short round trip on the Rhine river. This is positively impacting the tourist flow. The Rhine is the second largest river in Western Europe, it starts in Switzerland and empties into the North Sea in the Netherlands. It has always been a very important waterway from the early days of the Roman Empire until today carrying kings, armies, pilgrims, merchants and travellers. The Upper Middle Rhine from Rüdesheim to Koblenz was added to the UNESCO list of World Heritage Sites in June 2002 for a unique combination of geological, historical, cultural and industrial features. With more than 40 castles and fortresses from the Middle Ages situated on virtually every hill top and the many wine-villages if it often referred to as the Romantic Rhine. 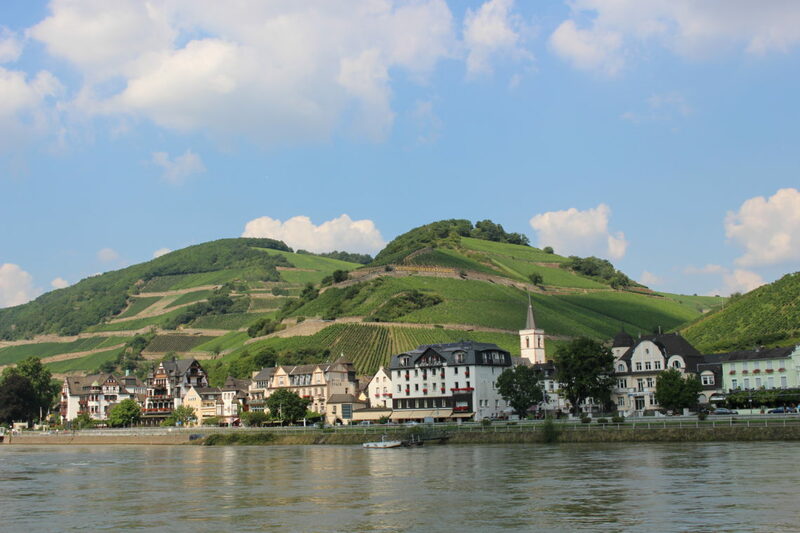 Rüdesheim is one of the best departure ports for these day-trip excursion riverboat cruises. Most popular is the cruise from Rüdesheim, past the Loreley Rock to St Goar and St Goarhausen. Overall, Rüdesheim is very much focused on tourism. However, it is not an unpleasant town to spend some time in certainly as the food is good and the wine is always flowing generously.